If you’ve followed my blog, you’ll be aware that I’ve been comparing the present year to the average of the past 3 years when I compile the market updates. The story in the Financial Post illustrates the reason why. A single year can be an outlier, an anomaly. It can severely distort the overall picture when comparing to a single year. In the same article, David Madani of Capital Economics gets thrown under the bus for his history of incorrect predictions. He’s been predicting a 25% correction consistently for 30 months. If the Canadian market declines 25% from today’s prices, it will be pretty much back where it was when he started his forecasts. 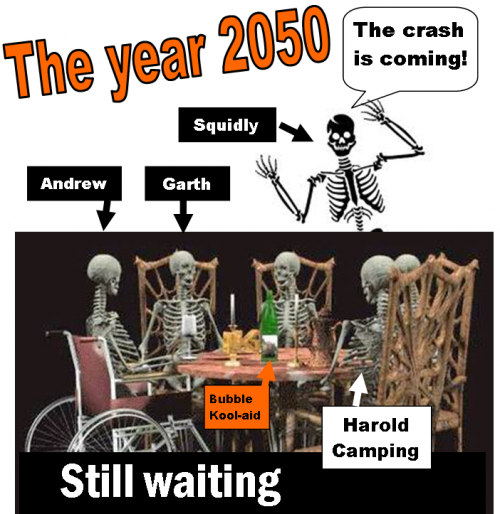 Now that Harold Camping has met his maker, perhaps Madani can take his place at the table. I’m not sure how a guy like Madani is able to keep his job in the light of such incorrect forecasts. On Capital Economics home page it states, “we have gained an enviable reputation for original and insightful research.” Good thing they don’t claim that it’s accurate. This entry was posted in Historical comparison, Predictions, Statistics. Bookmark the permalink. More great RE results come out driving turner insane(r). So what does the dishonourable turner do? Ahhh, yeah OK, good work gartho. Maybe he should compare Calcutta to Calgary or Toronto, that would get his psycho cult members chanting in the streets. Considering these 6 topics are all he ever talks about, I think that equates to a 0% success rate. Kind of like his Finance days. Both Madani and Barf Turder are becoming more desperate with each passing month. At least the other member of the disgraced trio, ‘Ben Rabid-Dog’ has sort-of capitulated and has finally ceased making goof-ball predictions. News flash bozos: Time’s Up! You Lose! Is this guy wrong Bob or is he another doomer like GT? He is an ex realtor so he knows the ins and outs. No? He implies that the CREA numbers are not fully truthful to say the least. Further to YYC’s question, perhaps Teranet’s data is a more trustworthy corroboration to CREA’s numbers. Teranet is independent and does not use any real estate board’s data in their research. They report that nation-wide prices reached an all-time high in July. At one time I compared Teranet’s numbers to CREB’s median price. The two followed each other so closely, I concluded that CREB’s numbers were an accurate portrayal of the market, and until recently, Teranet was always a month late. Six to seven years ago, Mike and I started giving out free information that was more complete and timely than you could get anywhere else. I doubt if anyone remembers the days where CREB’s month-end report would take up to 3 days to reach our eyeballs, or when the daily stats consisted of a ticker giving the average price. That was all you got. It took a few years, but the “rising tide lifts all ships” scenario was proven true once again, and now CREB has a reputation for promptness, innovation, and accuracy. Nobody in Canada has better or more thorough information about their housing market than Calgarians.